The local fibre arts group I belong to that meets at Satin Moon decided to set ourselves monthly challenges this year to keep things interesting. The challenge for January was anything starting with J, which one member dubbed the J-Cloth Challenge. Here’s my finished piece, well finished except for the hanging sleeve. The centre medallion is a sketch I made in the fall in Melanie Testa’s drawing challenge. Thanks to Spoonflower it’s now on fabric and you can even buy it! 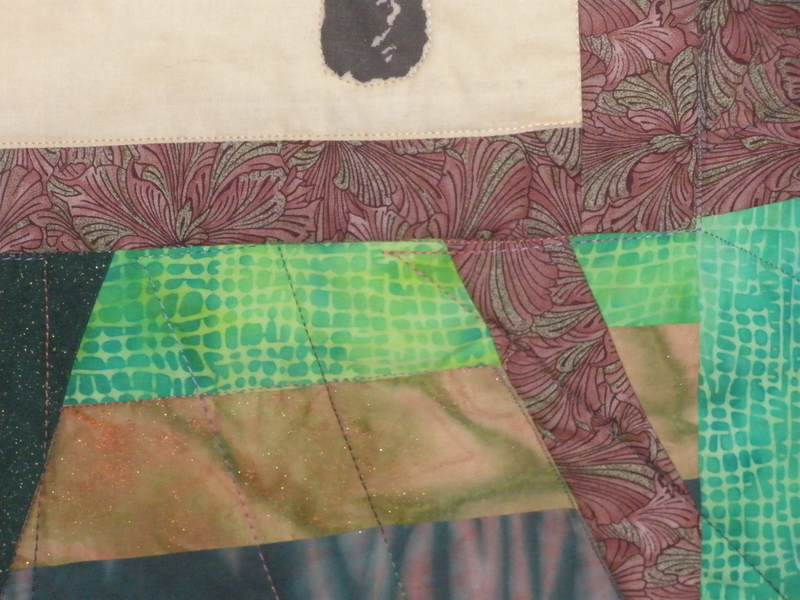 This detail shows Dale MacEwan’s sunpainted fabric. 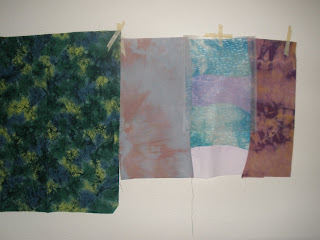 It’s the pale pink and green in the middle between the green batik and my red and green shibori made in Susan Purney Mark’s class. Combinations of red and green fascinate me. It’s often found in nature from rhubarb and red leaf lettuce to geraniums, yet not exploited that much by artists for some reason, nor in decoration. Maybe people think it’s too Christmassy? What do you think? Can those apparently overdone combos like orange and black or pink, red, and purple be revamped into something that doesn’t scream “Boo” or “Goo”? Last night my fibre arts group met and I took this to show everyone. This is a mola made following Cathy Miller’s method, with a little wrinkle I thought up myself that saves you from the torture of sewing the binding on. 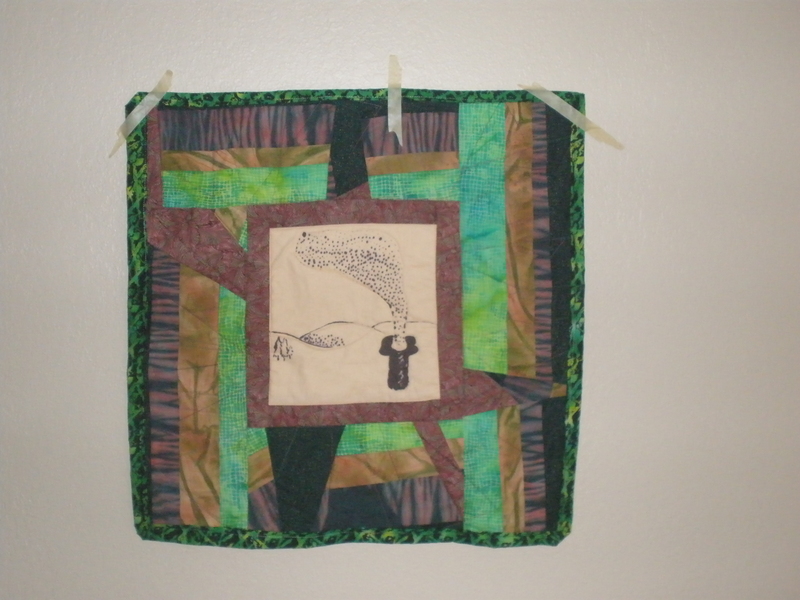 It also has the too-beautiful-to-cut fabric as the backing as well as forming the dragonfly image. 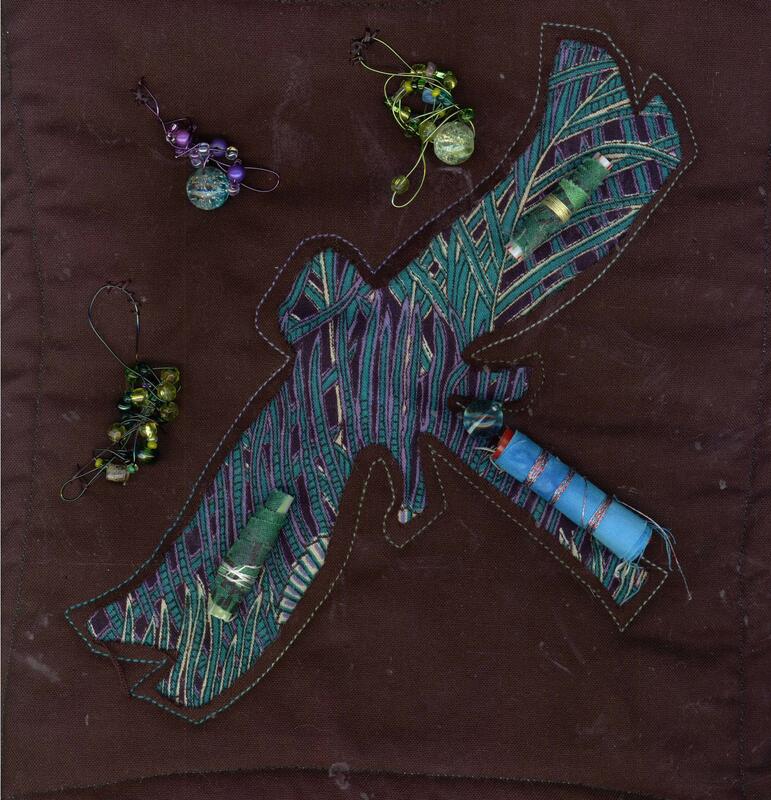 Some of the beads were made in Laine Canivet’s workshop, others were made earlier, and some were purchased. I learned that it’s best to use black beading thread when attaching embellishments to a black background! We discussed how to continue our Round Robin/challenge into next year or perhaps start a new one. Since the weather has been snowy we were a smaller group than usual so no firm conclusions have been arrived at. 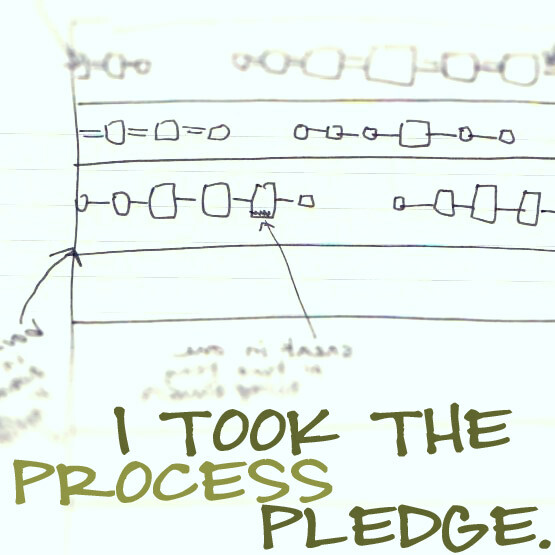 We need to balance the group work with personal control over the pieces we are working on. Does anyone have any thoughts on how to do this or ideas for creative challenges we could consider? It’s always interesting to share different concepts. My local fibre arts group FAD (Fibre Art and Design) has decided that our next meeting is to share our favourite websites and other sources of inspiration. This post is so everyone will have a permanent record of mine, and perhaps we can all somehow link or find a way to share each others’ sources (not everyone blogs). 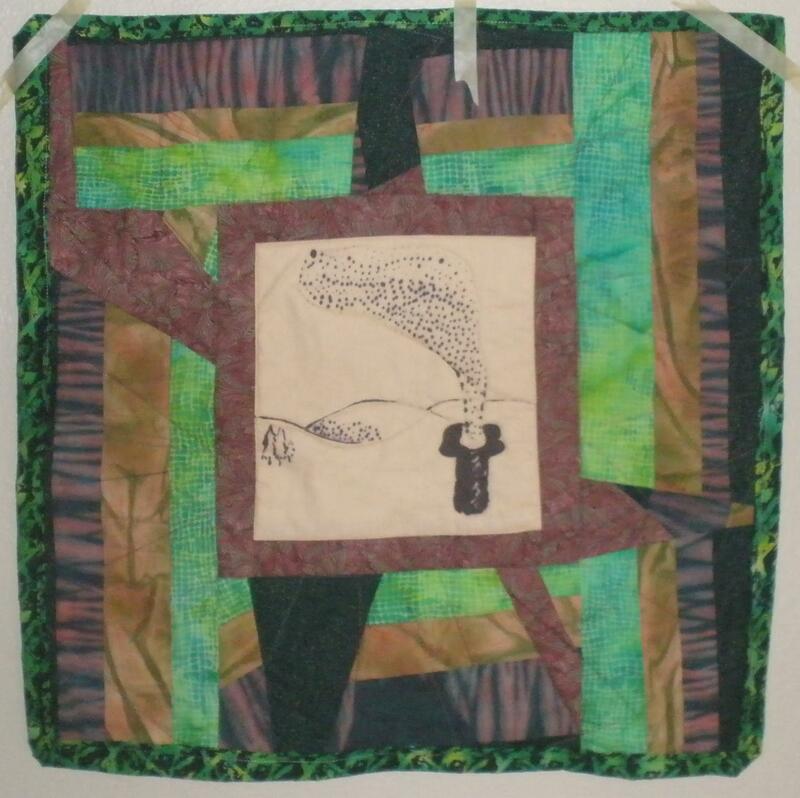 Inspiring projects using silk in a variety of ways. The author has lived overseas in Turkey and Malaysia. The techniques in the book are simple and have many possibilities. I have sketchbooks in various sizes going back years with quilt designs, websites, paint chips, postcards, quotes, notes from presentations at guild meetings and workshops, etc. It’s interesting to look back and see how long some concepts have been percolating and how they’ve developed. Also interesting is how the page size keeps increasing, although after the Gail Harker workshop I dialed it down a notch with one purse size one and one 9″ square sketchbook with heavy paper that will take acrylic paint. Plus the rest of the blogroll too! This is the challenge piece I’m working on. Its current state is the top photo — the strip on the right is auditioning and not sewn on yet, nor is the ExtravOrganza. In fact I flipped that strip around and now it looks better because the light green continues the motion in the dark piece to the left of it. Everything is hand dyed except for the dark green/blue around the top and sides. Interestingly this framing of the top and sides is the same as in Ballerina, and even the impression of sideways motion coming from the right of the piece is similar. Wow, a series! Soon I will be reaching the point where the top is finished, and since Susan wants to take photos at the next FAD meeting I will need to decide whether to layer and quilt it and have it completed by the 19th or leave it as is and then pick it up after the 19th. Probably I should stick to my motto and complete it. Here are the front and back of a piece of fabric Susan Purney Mark distributed at our last FAD meeting. 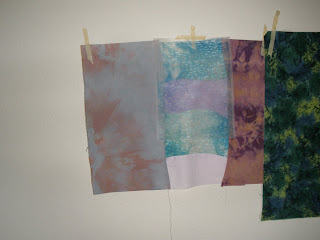 The challenge is to create a piece using this fabric that is ready to be photographed by the next FAD meeting in February. Susan CLAIMED that this was originally a really ugly fabric until she did things to it, which is hard to believe. I scanned both sides of my piece because they are so different. 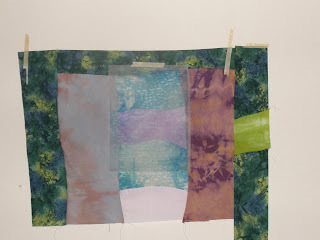 Of course due to all the processes Susan had tried out on the fabric, everyone’s piece was significantly different. Also printed the side at the top on a piece of ExtravOrganza. This will be in the piece somehow, not quite sure exactly how yet. Have pulled out a bunch of other mottled/dappled fabs (and have not yet been into the green and purple bins!). My thoughts are running on curved seams so I’ve made a practice piece using other fabrics because I don’t want any flubs using the “good” fabric. Will post a photo or scan of that later. Off to my green bin I go!